Nine is a musical, initially created and written by Maury Yeston as a class-project in Lehman Engel's BMI Music Theatre Workshop in 1973. It was later developed with a book by Mario Fratti, and then again with a book by Arthur Kopit, music and lyrics by Maury Yeston. The story is based also on Federico Fellini's semi-autobiographical film 8½. It focuses on film director Guido Contini, who is dreading his imminent 40th birthday and facing a midlife crisis, which is blocking his creative impulses and entangling him in a web of romantic difficulties in early-1960s Venice. The original Broadway production opened in 1982 and ran for 729 performances, starring Raul Julia. The musical won five Tony Awards, including Best Musical, and has enjoyed a number of revivals. Yeston began to work on the musical in 1973. As a teenager, he had seen the Fellini film and was intrigued by its themes. "I looked at the screen and said 'That's me.' I still believed in all the dreams and ideals of what it was to be an artist, and here was a movie about an artist in trouble. It became an obsession," Yeston told the New York Times. He would go on to say "Nine was the thing I really desperately wanted to write—never thinking for a minute that it would ever be produced. The movie had a phenomenal impact on me when I saw it as a teenager when it first came out. I was fascinated with Guido who was going through a second adolescence when I was going through my first! As I grew I began to realize that there was room to explore the reactions of the inner workings of the women in Guido’s wake. I think that’s what opened the gateways of creativity for Nine—to hear from these extraordinary women. The great secret of Nine is that it took 8 1/2 and became an essay on the power of women by answering the question, “What are women to men?” And Nine tells you: they are our mothers, our sisters, our teachers, our temptresses, our judges, our nurses, our wives, our mistresses, our muses." Playwright Mario Fratti began working on the book of the musical in 1977, but the producers and director Tommy Tune eventually decided his script did not work, and brought in Arthur Kopit in 1981 to write an entirely new book, working (as Fratti had) with Maury Yeston as composer/lyricist, but now using Yeston's music, and Fellini's film, as the source. Kopit's new book, along with Yeston's now completed score, became the script that was produced on Broadway in 1982. Originally conceived as a male/female cast, many of the changes into a mostly all women cast were created in a workshop that rehearsed in the upstairs theatre at the New Amsterdam Theatre in the Fall of 1981. For their participation, the workshop cast was given a small percentage of the show for a limited amount of time. Kathi Moss was the only cast member of the original Broadway cast that did not participate in the workshop (Pat Ast played the role of Saraghina in the workshop). After nineteen previews, the Broadway production, directed by Tommy Tune and choreographed by Thommie Walsh, opened on May 9, 1982 at the 46th Street Theatre, where it ran for 729 performances. The cast included Raul Julia as Guido, Karen Akers as Luisa, Liliane Montevecchi as Liliane, Anita Morris as Carla, Shelly Burch as Claudia, Camille Saviola as Mama Maddelena, Kathi Moss as Saraghina, Cameron Johann as Young Guido, and Taina Elg as Guido's mother. Rounding out the cast were Christopher Evans Allen, Jeanie Bowers, Stephanie Cotsirilos, Kim Criswell, Kate DeZina, Colleen Dodson, Lulu Downs, Louise Edeiken, Laura Kenyon, Linda Kerns, Nancy McCall, Cynthia Meryl, Rita Rehn, Dee Etta Rowe, Jadrien Steele, Patrick Wilcox, Alaina Warren Zachary. Raul Julia played Guido for one year, from May 9, 1982, to May 8, 1983. (Bert Convy replaced Julia while he was on vacation for two weeks, beginning January 10, 1983.) Sergio Franchi starred as Guido for 330 performances, from May 9, 1983, to February 4, 1984, the date the production closed; composer Maury Yeston added a Franchi-style ballad, "Now Is the Moment," to the lovely Italian-sounding score. Other replacements were Maureen McGovern and then Eileen Barnett as Luisa, Wanda Richert as Carla, Priscilla Lopez as Liliane, and Barbara Stock as Claudia. Once the original boys reached the required height for their roles, they were replaced by Derek Scott Lashine as Little Guido, Jeffrey Vitelli (also the understudy for Little Guido), Braden Danner, and Peter Brendon. The musical won five Tony Awards, including best musical and three Drama Desk Awards, including Best Music, Best Lyrics, and Best Musical. An original cast recording was released by Sony and was nominated for a Grammy Award. The original plans were for the Broadway show to continue even as the National Tour commenced. However the new producers (James Nederlander and Zev Buffman) made the right offer for the road show, and the Broadway production was closed so that the whole Broadway cast could go on the road with Sergio Franchi as the headliner. Nineteen cities were originally planned, but several venue changes were made during the tour. The most prominent was the canceling of a Baton Rouge venue so that show could serve for the Grand Opening of the Los Angeles Civic Light Opera season. This was to accommodate the cancellation of On Your Toes after Leslie Caron (the star) was hospitalized due to a hip injury. When the decision was made to close the road show after the San Francisco shows, Louisiana fans were upset that an alternate date had not been created for them. (Sergio Franchi was extremely popular in Louisiana.) The reviews were generally very favorable, although a DC reviewer lamented some production changes (although admitting that they had not viewed the original Broadway production). The production venue was changed from a spa to a railroad station, principally to accommodate the volume of scenery that needed to be transported from location to location. The other change lamented in DC was the lighting. One review of the Florida production acknowledged that the grey railroad station with light-studded arches may have been "even more surreal than its creators may have intended." In contrast, the San Diego reviewer expressed admiration for Marcia Madeira's "flattering light design" and declared "Nine" to be "wonderful to watch." 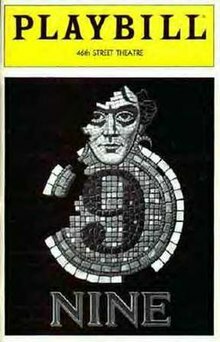 On June 7, 1992, the largest production of Nine to date was presented in concert in London at Royal Festival Hall with Jonathan Pryce, Becky Norman, Elizabeth Sastre, Ann Crumb, Kate Copstick, and Liliane Montevecchi. 165 people were in the cast, including male characters, as originally conceived. The production was directed by Andrew MacBean and a recording of the concert (with Elaine Paige stepping in as Claudia) was released by RCA Victor. On December 12, 1996, a small-scale production directed by David Leveaux and choreographed by Jonathan Butterell opened at the Donmar Warehouse, where it ran for three months. Performers included Larry Lamb (Guido Contini), Ian Covington (Young Guido), Sara Kestelman (Liliane La Fleur), Clare Burt (Carla), Eleanor David (Claudia), Susannah Fellows (Luisa), Jenny Galloway (Saraghina), Ria Jones (Stephanie Necrophorus), Dilys Laye (Guido's Mother), Kiran Hocking (Our Lady of the Spa). Other cast members included Emma Dears, Kristin Marks, Tessa Pritchard, Sarah Parish, Norma Atallah and Susie Dumbreck. It was designed by Anthony Ward. In 2003, the Roundabout Theatre Company produced a Broadway revival with director Leveaux and choreographer Butterell. It opened on April 10, 2003 at the Eugene O'Neill Theatre, where it ran for 283 performances and 23 previews and won two Tony Awards, including Best Revival of a Musical. The cast included Antonio Banderas as Guido (who received a Tony Award nomination), Mary Stuart Masterson as Luisa (who received a Tony Award nomination), Chita Rivera as Liliane, Jane Krakowski as Carla (winning the Tony), Laura Benanti as Claudia, and Mary Beth Peil as Guido's mother. Replacements later in the run included John Stamos as Guido, Eartha Kitt as Liliane, Rebecca Luker as Claudia, and Marni Nixon as Guido's mother. Yeston replaced a waltz dance from the original Folies Bergere number with a showstopping Tango Duet for Banderas and Rivera, A revival cast recording was released by PS Classics. Jenna Elfman was hired and advertised to join the cast as Carla at the same time that Stamos and Kitt were joining the production. A few days before the opening it was announced she needed more rehearsal time and that her understudy Sara Gettelfinger would take over temporarily. Elfman never did join the company and Gettelfinger played the rest of the run. The European premiere of Nine opened in Sweden, at the Oscarsteatern, Stockholm, September 23, 1983, with Ernst-Hugo Järegård (Guido), Siw Malmkvist (Luisa), Viveka Anderberg (Claudia), Suzanne Brenning (Carla), Anna Sundqvist (Saraghina), Berit Carlberg (Liliane La Fleur), Helena Fernell (Stephanie), Maj Lindström (Guido's Mother), Moa Myrén (Lady of the Spa), Ewa Roos (Mama Maddalena), Lena Nordin(Maria). Other cast members included Monica Janner, Marit Selfjord, Berit Bogg, Ragnhild Sjögren, Solgärd Kjellgren, Ann-Christine Bengtsson, Siw Marie Andersson, Anna Maria Söderström, Susanne Sahlberg, Vivian Burman, Hanne Kirkerud, Susie Sulocki, Annika Persson, Charlotte Assarsson, Anna-Lena Engström, and Kim Sulocki (Guido as a child). The Australian premiere of Nine was staged in Melbourne at the Comedy Theatre in 1987. John Diedrich produced, directed and starred as Guido Contini. As Luisa Contini, Maria Mercedes's portrayal received critical acclaim and nominations for Best Actress in a Musical at the Melbourne Green Room Awards and the Sydney Theatre Critics Circle Awards . Maury Yeston after attending the Sydney opening night proclaimed that Maria Mercedes was the definitive Luisa Contini. The cast also included a young Tina Arena, the Australian singer, songwriter and actress who went on to have an international recording and performing career. Other cast members included Nancye Hayes (as Liliane La Fleur), Peta Toppano as Claudia, Caroline Gillmer as Sarragina, Jackie Rees, Gerda Nicholson, Kerry Woods, Anna Lee, Sally Anne Bourne, Alana Clark, Sally Clark, Alison Jiear, Donna Lizzio, Cammie Munro, Marie-Jackson, Sharon Jessop, Alix Longman, Lisa O'Dea, Anne Sinclair, Janice Torrens, Penny Richards, and Mimi Rubin. A cast recording of the Australian production was recorded for Polydor and later released on CD by the TER record label. It won the ARIA Award for Best Original Soundtrack or Cast Album. The Argentinian premiere of Nine (1998) won several ACE Awards. Performers included Juan Darthes (as Guido), Elena Roger, Ligia Piro, Luz Kerz, Sandra Ballesteros and Mirta Wons. The musical premiered in Germany at the Theater des Westens in 1999 in Berlin. The musical played in Malmö, Sweden at Malmö Opera in 2002 with Jan Kyhle (Guido), Marie Richardson (Luisa), Sharon Dyall (Claudia), Petra Nielsen (Carla), Marianne Mörck (Sarraghina), Lill Lindfors (Liliane La Fleur), Annica Edstam (Stephanie Nechrophorus), Victoria Kahn (Gudio's Mother). The original Japanese production premiered in Tokyo in 2005 with Tetsuya Bessho as Guido Contini and Mizuki Ōura as Liliane La Fleur. The musical premiered in San Juan, Puerto Rico in the fall of 2010 with Ernesto Concepción as Guido Contini, Sara Jarque as Luisa, Wanda Sais as Carla, Marian Pabón as Lilliane Le Fleur, Tita Guerrero as Lina Darling, Michelle Brava as Claudia Nardi, Aidita Encarnación as Saraghina, Yezmín Luzzed as Stephanie Necrophorus and Hilda Ramos as Mamma. The production was directed by Miguel Rosa who previously directed the Puerto Rico premiere of Rent in 2009. The Phoenix Theatre in Arizona revived Nine in the spring of 2011, starring Craig Laurie (Guido), Patti Davis Suarez (Mother), Jeannie Shubitz (Luisa), Kim Manning (Liliane), Jenny Hintze (Claudia), and Johanna Carlisle (Saraghina). The musical premiered in Manila, the Philippines, in September 2012, produced by Atlantis Productions. Jett Pangan starred as Guido Contini alongside an all-star cast of women, scenic design by Tony Award winning David Gallo and costume design by Robin Tomas. The musical premiered in the Czech Republic, at the Josef Kajetán Tyl Theatre in Pilsen in December 2012. The musical premiered in Brazil, at Teatro Porto Seguro, in São Paulo, directed by Charles Möeller and Claudio Botelho, starring Italian actor Nicola Lama as Guido, Carol Castro as Luisa, Totia Meireles as Lili la Fleur, Malu Rodrigues as Carla, Karen Junqueira e Vanessa Costa alternating as Claudia, Letícia Birkheuer as Stephanie, Beatriz Segall, Sonia Clara alternating as Guido's mother and Myra Ruiz as Saraghina . On April 12, 2007, Variety announced that Rob Marshall would direct a feature film adaptation of Nine for the Weinstein Company. Marshall had previously directed Chicago for the Weinsteins while they were still at Miramax. The screenplay is written by Anthony Minghella with Michael Tolkin serving as an uncredited co-scripter. The cast consists of Academy Award winners Daniel Day-Lewis, Marion Cotillard, Penélope Cruz, Judi Dench, Nicole Kidman, and Sophia Loren, with Academy Award nominee and Golden Globe winner Kate Hudson and Grammy winning singer Fergie. Among other cast changes in the film version, the character of Mama Maddelena does not appear, and Claudia's surname was changed from Nardi to Jenssen. The script makes Guido 50 (Day-Lewis's actual age), not 40 as in the stage original. The film's final coda is more hopeful and optimistic than the stage version. In addition, director Marshall cut most of the original production's score, with only "Overture delle Donne," "Guido's Song," "A Call from the Vatican," "Folies Bergeres," "Be Italian," "My Husband Makes Movies," "Unusual Way," and an extended version of "I Can't Make This Movie" making it into the final edit of the film. Composer Maury Yeston wrote three new songs for the movie including "Cinema Italiano," "Guarda la Luna" to replace the title song, and "Take It All" in place of "Be On Your Own," as well as the instrumental concluding the film. The film is co-produced by Marshall's own production company Lucamar Productions. The film was released in the US on December 18, 2009 in New York and Los Angeles and opened for wide release on December 25, 2009. ^ "Library Services - Information Services - University of Kent". Retrieved on 4 February 2017. ^ operasolisterna. "Lena Nordin – Kungliga Teaterns Solister". Retrieved 2019-02-12. ^ "HugeDomains.com - AtlantisProductionsInc.com is for sale (Atlantis Productions Inc)". Retrieved on 4 February 2017. ^ Carvalho, Eduardo. "Novo musical de Charles Möeller e Claudio Botelho, 'Nine' estreia 21 de maio, no Teatro Porto Seguro, em São Paulo" Archived 2016-03-05 at the Wayback Machine. Retrieved on 4 February 2017. ^ Carvalho, Eduardo. "Nine - Um Musical Felliniano (2015)". Retrieved on 4 February 2017.